To put it this in perspective, in India, the average cost of saving a cow from the slaughterhouse is $100. To provide food, shelter, and medical care for a one cow for one year is only $200. For $51, one hundred animals can be fed for a day. 2018 Goal - Collect and donate $70,000 in India and $10,000 in USA for Jivdaya. We are looking into several projects for donations in India. Jivdaya committee is looking forward to your ongoing support in 2018 to this worthy cause for needy panjarapoles and silent animals. Donated $40,919 fodder to 37 panjarapoles in Gujarat. Collected & donated $22,541 for North Gujarat Relief fund, built 2 animal shelters in Thera and Unn in North Gujarat, each costing Rs. 5 Lakhs ($7,800 each). Donated Animal ambulance to Bhavanagar Jilla Jivdaya Parivar - Akhil Bhartiy Navug Sanstha - at a cost of Rs. 2.5 Lakhs ($3,900). In the past 5 years JAINA has on average sent $20, 000 per year to various panjarapoles in India and $5,000 per year to various animal shelters in the USA. Build a shed in Mandal Panjarapoles in Gujarat and supported major upgrading of a shed at Radhanpur Panjarapoles. 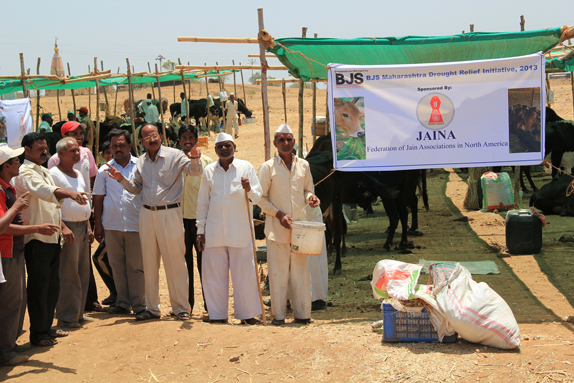 In 2013, Jivdaya committee supported and worked with the Bhartiya Jain Sangathana in Maharashtra to provide food, water and shelter to animals. Between 2005 and 2007, the committee received funds that were distributed to approximately 26 Pinjrapoles in India. The funds were used for distributing fodder, grass, bird seeds and helping the animal shelters during periods of drought. Baroda panjarapoles one of them that built a shade for the shelter of animals and named it JAINA-USA Shade. Shed for Sheltering 200 cows at Shri Dutt Sai Goseva Sanstha Nasik, Maharashtra. We are counting on your generous support for the purposes of Jivdaya. Donations made through JAINA are tax-deductible. Please contact any of the Jivdaya committee members (listed above) if you need more information.